TURFFONTEIN (AUS) (Chestnut 2004-Stud 2010). 5 wins-1 at 2, MVRC William Reid S., Gr.1. Sire of 164 rnrs, 84 wnrs, inc. SW Fontiton (MRC Blue Diamond Prelude (f), Gr.2), Fontein Ruby, Widgee Turf, Lyuba, SP Turfane and of Mandela Effect, Fontein Lad, Faint Blaze, Finke, Safariann, Give Us a Go, Hunters Grace, Turf Crusher, Eskdale Girl, Central Pass, Constantine, Double Superlative, Sight Leader, Toy Boy, Dance With Fontein, Gold Fontein, etc. Mandela Effect (g. by Turffontein). 3 wins. See below. Royal Work (Matsqui). 8 wins from 1200m to 2200m, A$104,303, TRC Think Pink Cup July 22 H., Northgate Shopping Centre H., Tatt's Group H., Tattersall's Park Function Centre P., TTC Tasmania Racehorse Owners Association H., 2d TRC Dudley Clark Industrial Land Supplies H., Brighton Bypass H., Bellerive Yacht Club H., Roberts Estate Wines P., 3d Tasmanian Guineas, L, TRC Tattersall's Park Function Centre H., George Self Real Estate H.
Charzard. 6 wins from 1600m to 2200m, TRC Cheaper Furniture Summer Cup, Raine & Horne Show Cup, Government of Tasmania H., Cascade Premium H., TTC Harvey World Travel H., 2d TRC Wrest Point Five Star Premium Suite H., Saab 9-3 Linear H., Premium Floating Floors H., TTC Nichols Communications H., 3d TRC Brighton Council H., Instant Scaffolds H.
Sister Quest. 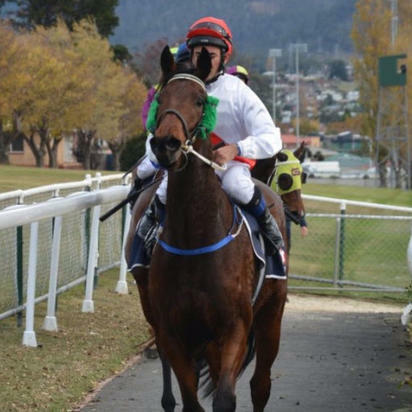 4 wins at 1150m, 1600m, TTC Launceston Mitsubishi H., 2d TTC Young Racegoers Function H.
Kid Dynamite. 4 wins at 1100m, 1200m, TRC Tasmanian Hospitality Association H., Dudley Clark Land Sale H., TTC Flexi Quadrella H., 3d TTC Tote Tasmania H.
Little Pumba. 2 wins at 1200m, 1400m in 2017-18, TTC Fish 'n' Chips at Seaport H.
Miss Jimbob. Winner at 1550m in Aust. Barooga. 2 wins at 1100m, 1650m, TRC Bass H.
PERSIAN SAINT (Rajah Sahib). 6 wins-2 at 2-from 1000m to 2000m, MVRC St Albans S., L, VRC Flemington S., L, Batman S., L, MVRC Albion H., Kalkallo H., VRC River H., 3d VRC Maribyrnong Trial S., L, 4th VATC Debutant S., Gr.3. Sire. Justajoke (Red Rumour). 7 wins from 1500m to 2800m, VATC Bond H., VRC Alan Bell H., MVRC Magdala H., 3d VRC Maribyrnong Trial S., L.
MIGHTY MANITOU (Manihi). 3 wins-2 at 2-to 1400m, A$75,650, AJC Sires' Produce S., Gr.1, SAJC Great Western P., L, Weigall H., 2d MVRC Herald Vase H., L, VRC Gibson-Carmichael S., L, VATC Spring S., VRC Criterion H., 4th VATC Blue Diamond S., Gr.1, VRC Linlithgow S., Gr.2. Sire. Anaspeed (Godswalk). 2 wins-1 at 2-at 1200m, SAJC Honda Buffalo H., VRC Volvo 760 H., 2d SAJC Harpagus H., Blackjack H., 3d MVRC Silver Jubilee S., L, SAJC Out of Danger H. Producer. Peron (Corrupt). 7 wins from 1600m to 2900m, NZ$114,525, Hawkes Bay Stephen Hill Motors H., LI Redshaw Ltd H., WRC Nobilo Wine Group H., Lion Brown H., 2d Rotorua Cup, Gr.3, Wanganui Cup, L, WRC Porirua Club Cup, 3d Woodville-Pahiatua Cup. Quashqai. 8 wins-1 at 2-from 1100m to 1950m, VRC Artilleryman Welter H., Newhaven H.
Baluchi. 8 wins from 1000m to 2600m, MVRC Precipitation H., 2d VATC Wanalta H.
DEEP PILE (Plush). 8 wins-1 at 2-to 1300m, A$137,660, STC Civic H., L, AJC Eye Liner H., STC Parkroyal St Kilda Road H., Hawaii H., Baldoyle H., AJC Monte Carlo H., STC BMW 850 H., 4th STC Birthday Card H., L. Producer. Race Record: 8 Starts 3-4-0 A$56,350. 3 wins at 1200m, 1400m in 2017-18, TRC Edyth Langham Autumn Sprint, Carlton Draught H., 2d TRC PFD Food Services 2YO H., TTC Blair & Sons Sawmill Classic.